Would it take you by surprise if a grumpy customer sent out nasty Tweets about your biz and the message would spread? Do you have a plan for damage control? Every now and then we hear about social media crises – often an event when customers complain publicly and their complaints are read by thousands or millions via Twitter, Facebook, and Blogs. Yet, few business owners realize how fast criticism spreads through social media, and how fast customers learned to use social. “We don't always believe that crisis will happen in social media, but they absolutely do. I mean, things happen and increasingly, it's out of our control. When every customer is a reporter and things happen in real time, crises can occur that can impact yourbrand in social media. 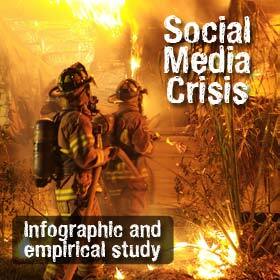 In this post you’ll see 2 studies that examined how social media crises spread. Jeremiah Owyang’s study covers the years 2001 through 2011; Christian Faller’s study covers 2011 in more detail. In which channels did the crises start? What were the triggers of the crises? What were the causes of the crises? What are the recommended action points for businesses? There’s no telling what impact crisis will have on your business when you face it unprepared. You’ll probably sit on the sidelines watching as the disaster unfolds. Use the info in this post to get a general idea about the problem, and start collecting ideas for your own pre-crisis planning. Here's an infographic with some of the findings. Here's Jeremiah Owyang's Slideshare presentation 'Social Readiness: How Advanced Companies Prepare.' 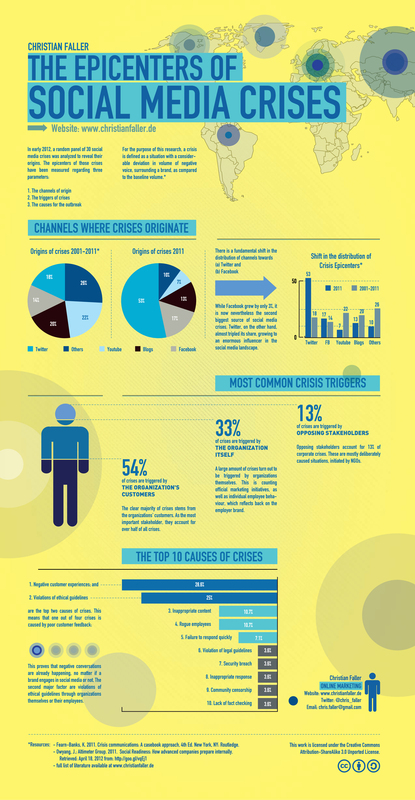 Social media crises on the rise – yet most companies are ill-prepared. 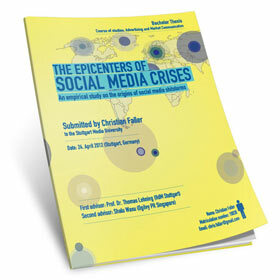 See pages 16 – 18 for charts on social media crises. The two studies above analyzed crises that were covered and documented by mainstream media, usually related to large corporations. Are social media crises limited to big business, or can they damage a small business just as hard? Do you have a pre-crisis plan? What are good steps to take before a social media crisis gets out of control? Social media crisis affects all businesses – big or small. but maybe it would affect small business more. I think what can prevent these crisis depends on how companies respond to clients concern. It is best to have an efficient customer service to address them immediately. Have downloaded the social media thesis and will read with interest. I am still convinced that most businesses are still in the advertising mode when it comes to Social Media. They really struggle to get the ROI of SM. I guess most businesses are overwhelmed. After all, even the experts struggle to ‘get’ the ROI of social media, or to agree on what it is, or how to measure. We've seen it happen to small businesses but the impact is hardly of the same proportions as for a big biz. All should have a pre-crisis crisis plan though. Also each campaign should have a crisis plan. Don't you find that most crisis are related to a "planned event" or to something that is completely predictable? Most companies don't get the point of social media. They use it as an advertising platform rather than a method to engage customers and potential customers. Social media is an extension of customer service, a way to answer queries and show that you are an expert in your field. It's an opportunity to show that you are human rather than just a website full of products that everybody else has. Every business has a time when things go wrong and have an unhappy customer. How a business handles that unhappy customer is key to maintaining your business reputation and solving a potentally damaging situation. I always say that if a complaint is handled properly you will have a customer for life. The way you do that is by being honest, saying sorry if needed and solving the problem. Whilst a crisis plan is important a business also needs to monitor its online reputation and be onto any potential problems before they get out of control. I believe it that both big and small business's are affected. I also believe that a lot of the issue can be solved from the companies end using custmor service skills to address the problem. Social media crises can be far more destructive to the small business. Many small businesses have little to no budgets for marketing to begin with, let alone for crisis preparedness. I was a little surprised that more than 30% were caused by the companies themselves, rather than a higher frequency of customer disatisfaction incidents. I love the unique perspective of this piece: "Social media, though, is not only what YOU are doing regarding your business, it’s also what your customers are doing." Too often we are just focused on what we are doing. I have downloaded the pdf and will refer to it in the coming months. We have all seen or shared a funny, enigmatic, weird or inspirational video on social media. The amount of images circulating there seems to be increasing, videos are the current trend. But of course, not all the videos posted get the attention or the “likes” they are intended to get. Games are in demand everywhere! Social gaming is the way forward to engage users in an interactive activity. Not all of us have the resources to develop unique games for our Facebook Fans, and so some Facebook Apps developing agencies have come up with plug and play facebook game apps. Effectively promoting your business on Facebook requires much more than simply registering with the online social media site. Applying marketing knowledge and keeping your fans engaged is the key to a successful business venture. Social media is such an amazing resource and nowadays thanks to smartphones can be used whenever you wish and wherever you want. At Discount Banner Printing we’ve used it to significantly grow our customer base and engage with existing customers. With the growing popularity of social media, blogging and online review sites, many companies using these tactics have started to put the responsibility in the hands of a community manager.